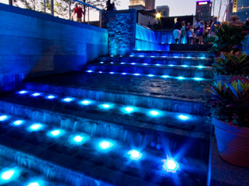 After over a decade of meticulous planning and design, the first features of Smale Riverfront Park will be completed in May, 2012. 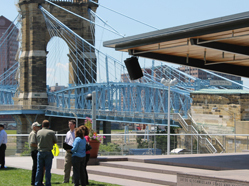 The park—built with a blend of City, State, Federal and private funding—provides a grand, new setting for the city’s beloved Roebling Suspension Bridge; and offers a dynamic recreational, entertainment and leisure resource for the citizens of Greater Cincinnati and visitors to this region. The park’s initial Phase I features—designed by Sasaki Associates of Watertown, Massachusetts—include fountains, walkways, a bike center, gardens, an event lawn and stage, a labyrinth, the Black Brigade Monument, a tree grove, and a restaurant. Future years will see the expansion of this destination park west of the Suspension Bridge. 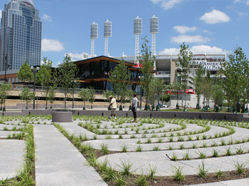 The park was planned, designed and constructed under the leadership of the Cincinnati Park Board—which manages a series of downtown waterfront parks extending from the Roebling Suspension Bridge, east to Sawyer Point and to Theodore M. Berry International Friendship Park. The park is divided into two primary levels. The Schmidlapp Event Lawn is part of the upper level and provides a green roof for the parking garage. An elevator at the east edge of the park near Joe Nuxhall Way just north of Mehring Way brings visitors from the parking garage up to the Event Lawn. An elevator adjacent to the Roebling Bridge at the west edge of the park at the upper level water plaza provides access to the lower part of the park along Mehring Way. Pathways within the park are universally accessible. Parking is available in the garage which visitors enter off Mehring Way. Bike racks are distributed throughout the park. The grand steps, complete with a bike “runnel” carved into the granite that allows riders to easily roll bikes up or down the stairway, is flanked by dramatic cascades and waterfalls which tumble into pools along Mehring Way. Additionally, colorful water curtains fall from glass balconies which abut a plaza filled with interactive water jets. A loggia allows visitors to walk behind the water curtains, with a glass walkway above. 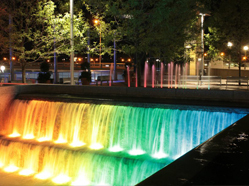 The cascades, jets and water curtains are vividly illuminated at night with thousands of combinations of colors. The event lawn is the setting for concerts, community festivals, informal picnics, recreational activities and play. 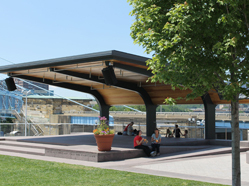 The performance stage—which includes lighting and sound capabilities—is protected by a canopy which is covered with solar panels. A broad pedestrian promenade borders the lawn and affords sweeping views of the river and the lower part of the park. The Bike Center is located at the foot of the Walnut Street Grand Stairway and is available for bike and mobility equipment rentals and bike repairs. It is also the home of the Park’s Visitor Center. The Bike Center also offers memberships for bike storage, showers and lockers. A section of the Ohio River Trail, a multi-use bike trail along the Ohio River, is in place in the park. It will eventually connect Madison, Indiana to New Richmond, Ohio and many sections of the trail are already complete. A tree grove frames the north side of the Roebling Green, extending from the Suspension Bridge to the Main Street Fountain. The grove is crossed by walking paths and contains a variety of ground covers. These are located just west of the Walnut Street Grand Stairway at the lower level. The park has several “green” features to make it more sustainable. The stair and elevator structure has a vegetated green roof. The Moerlein Lager House, the Bike Center, Public Toilet Rooms and maintenance spaces are all heated and cooled with a geothermal system. The Bike Center—with its bicycles, strollers and other mobility equipment available for rent—encourages people to bike to work and bike to the park to reduce the use of individual cars and the burning of fossil fuels. 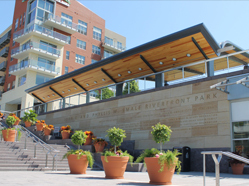 Smale Riverfront park is being built with a blend of Federal, State, City and private funding. 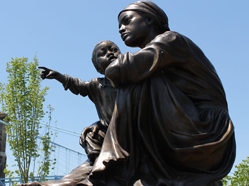 In the Spring of 2011, John G. Smale , former Chairman of Procter & Gamble, presented a gift of $20 million to the Cincinnati Parks Foundation for the construction of Phyllis W. Smale Riverfront Park. Mr. Smale’s gift was given in tribute to his late wife, who spent decades working tirelessly to raise funds for the city’s green spaces. 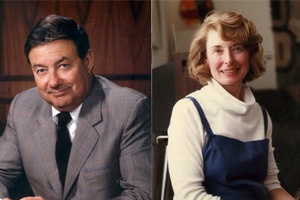 Upon Mr. Smale’s passing in the Fall of 2011, the park became The John G. and Phyllis W. Smale Riverfront Park. In future phases of construction, the park will extend to the west and will include such features as a transient boat dock, adventure playgrounds, a carousel, gardens, tree groves, promenades and fountains.